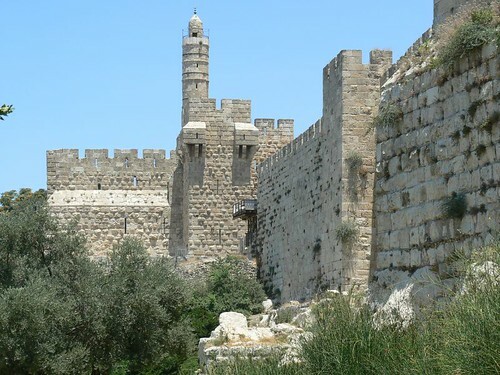 The current walls of Jerusalem Old City were built in 1538 by Suleiman the Magnificent. The walls stretch for approximately 4.5 kilometres, (2.8 miles), and rise to a height of 5–15 metres, (16–49 feet), with a thickness of 3 metres, (10 feet). Altogether, the Old City walls contain 43 surveillance towers and 11 gates, seven of which are presently open. Until 1887, each gate was closed before sunset and opened at sunrise. 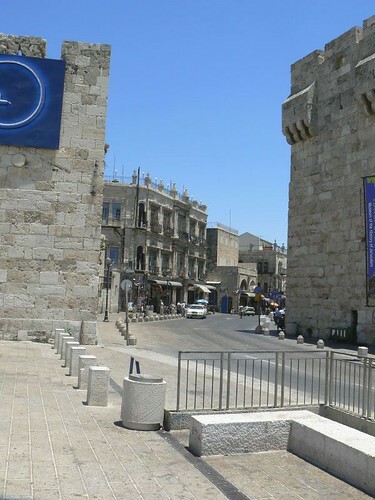 Jaffa Gate (Bab al-Khalil), constructed – 1530-40. The Jaffa Gate is so named because it is the portal for Jaffa Road, the precursor to the modern highway to the ancient port of Jaffa and the Mediterranean coastal plain. Next to Jaffa Gate is a breach in the wall that was opened to accommodate the entourage of the German emperor, Wilhelm II, in 1898. Running along the high city walls, south of the Jaffa Gate is the Citadel of Jerusalem, usually (but mistakenly) called the “Tower of David,” a Jerusalem landmark that dates back to antiquity. The current tower was built during the reign of the Ottoman sultan Suleiman the Magnificent. 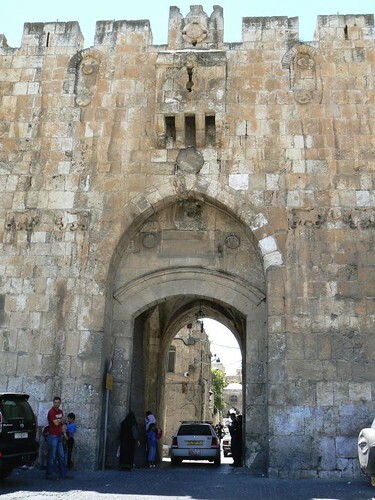 Zion Gate (Bab El-Nabi Da’oud), constructed – 1540. Located in the south of the Old City and facing towards Mount Zion and Hebron, it leads to the Armenian and Jewish Quarters. 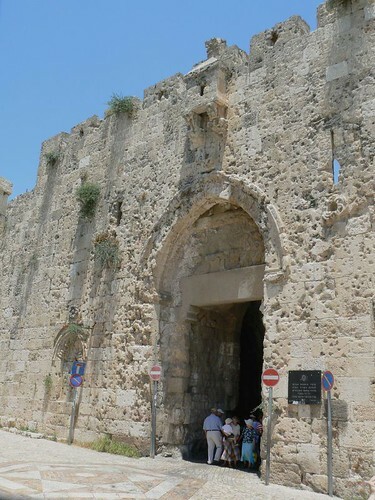 Zion Gate is also known as David’s Gate, because Mount Zion is believed by some to be the burial place of King David. In 1948, during the Israeli War of Independence, the Palmach unsuccessfully battled for control of the Jewish Quarter at the entrance of the Zion gate. This left the stones surrounding the gate pockmarked by weapons fire and riddled with bullet holes which can still be seen today. 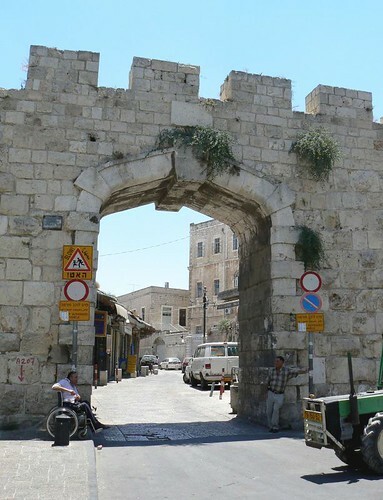 Dung Gate (Sha’ar HaAshpot, Bab al-Maghariba, Gate of Silwan, Mograbi Gate) constructed – 1538-40, is situated near the southeast corner of the old city, southwest of the Temple Mount. It was originally much smaller, but was enlarged in 1952, after the Old City came under Jordanian control in 1948. The name Sha’ar Ha’ashpot appears in the Book of Jeremiah. It is probably named after the residue that was taken from the Jewish Temple into the Valley of Hinnom, where it was burned. This ancient “Dung Gate” may not have been in the same location as the modern gate. 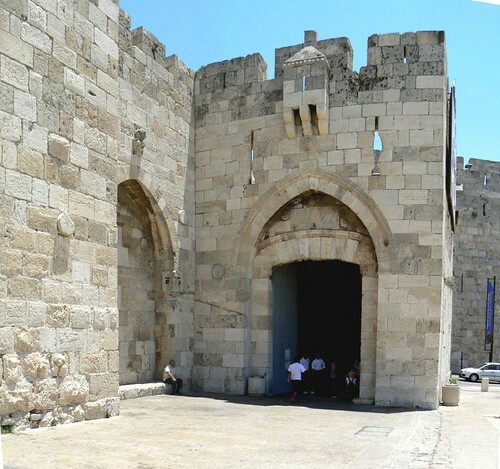 Lion’s Gate (Bab Sittna Maryam, St. Stephen’s Gate , Sheep Gate) constructed – 1538-9 , Located in the east wall, the entrance marks the beginning of the traditional Christian observance of the last walk of Jesus from prison to execution, the Via Dolorosa. 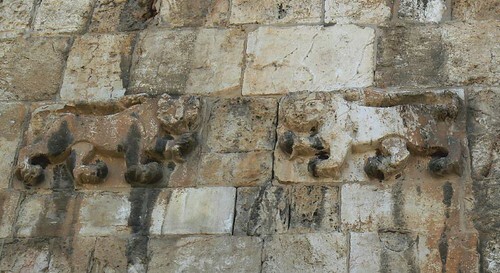 Near the gate’s crest are four figures of lions, two on the left and two on the right. Legend has it that Sultan Suleiman the Magnificent placed the figures there because he believed that if he did not construct a wall around Jerusalem he would be killed by lions. Israeli paratroops from the 55th Paratroop Brigade came through this gate during the Six-Day War of 1967 and unfurled the Israeli flag above the Temple Mount. Herod’s Gate (Bab-a-Sahairad, Sha’ar HaPerachim, Sha’ar Hordos, Sheep Gate) unknown when constructed, located in the East of northern wall. 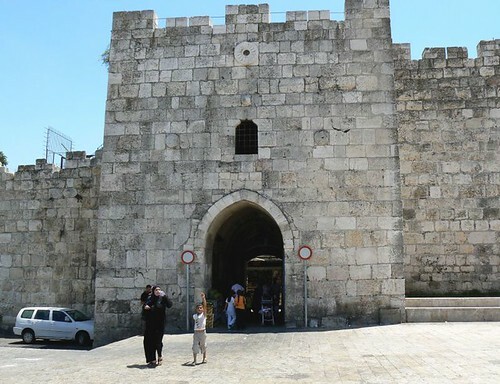 Damascus Gate (Sha’ar Shkhem, Bab al-Amoud, Nablus Gate) constructed – 1537, located in the middle of the northern wall. The original gate was presumably built in Second Temple times. The Romans built a new gate at the time of Hadrian, in the second century AD. 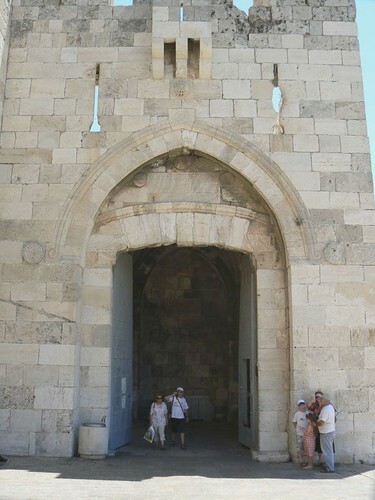 In front of the gate stood a Roman victory column, shown on the Madaba Map, thus giving the gate its name in Arabic to this day, Bab el-Amud, The Column Gate. The column has never been found, but the Roman gate can be seen today, due to excavations made during the British mandate. This was the northern entrance gate to the city at the time of the Crusades. 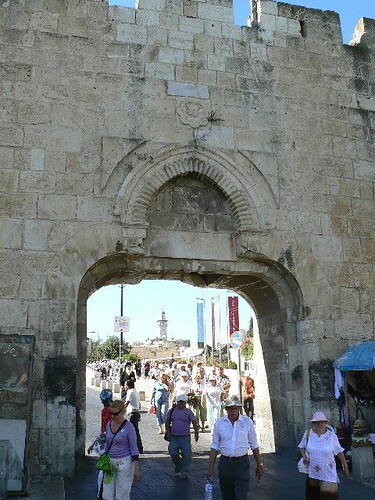 New gate (Al-Bab al-Jedid) is the newest gate in Jerusalem’s Old City Walls, built in 1898 to provide direct access to the Christian Quarter for the visit of the German Emperor William II. Located in the northwestern part of the wall. The Golden Gate, as it is called in Christian literature. Jews used to pray for mercy at the gate, hence the name Sha’ar Harachamim, the Gate of Mercy. In Arabic, it is known as the Gate of Eternal Life. In ancient times, the gate was known as the Beautiful Gate. 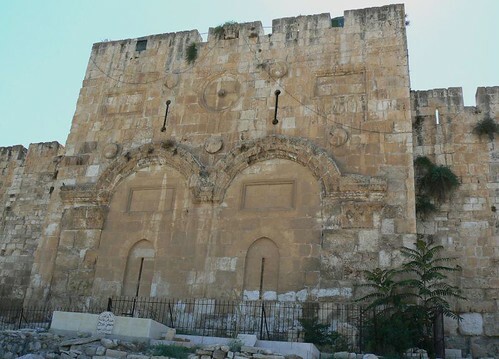 It was probably built in the 520s AD, as part of Justinian I’s building program in Jerusalem, on top of the ruins of an earlier gate in the wall. An alternate theory holds that it was built in the later part of the 7th century by Byzantine artisans employed by the Umayyad khalifs. The gate is located in the middle of the eastern side of the Temple Mount. 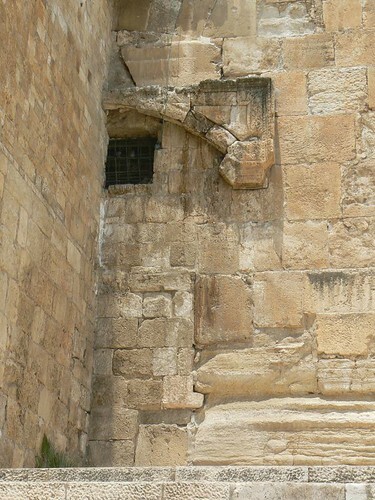 According to the Jewish tradition, this is the gate through which the Messiah will enter Jerusalem. Ottoman Sultan Suleiman I sealed off the Golden Gate in 1541, allegedly to prevent the Messiah’s entrance. The Huldah Gates are the two sets of now-blocked gates in the south wall of the Temple Mount, which is also one of Jerusalem’s Old City walls. The western set is a double arched gate (the double gate), and the eastern is a triple arched gate (the triple gate). Each arch of the double gate led into an aisle of a passageway leading from the gate into the Mount, and to steps leading to the Mount’s surface. The Gates was constructed By Herod the Great as Gates to the Temple Mount, only the base of the gate is originally from the second Temple.